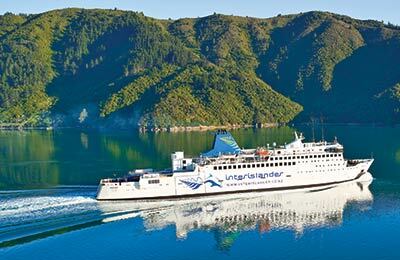 You can use AFerry to book an Interislander ferry between New Zealand's north and south islands. The Interislander ferry service is of the highest quality and features three ultra-modern luxurious ships equipped to the highest standards. AFerry always has cheap prices for Interislander ferries and the latest special offers. See below for the latest Interislander prices and sailing times. Click on your ferry route for a detailed Interislander timetable. The Kaitaki, Arahura and the Aratere are the names of Interislander's ships. The ship names are all in the Māori language. The Kaitaki, meaning "challenger" is New Zealand's largest ferry holding up to 1,600 passengers. On board, you will find many observation decks to enjoy the magnificent scenery of the Marlborough Sounds and Wellington's natural harbour. You can also sample freshly cooked local cuisine or enjoy coffee and wines from the many food and beverage outlets. The ship even features a cinema in case you feel like taking in a movie. For children, the Kaitaik offers nurseries, play areas and, during school holidays and peak seasons, even magicians and clowns. The Arahura, meaning "pathway to dawn", has been sailing across the Cook straight since 1983 and can carry up to 550 passengers. This wonderful modern ferry features a wine bar and food court, outside observation decks, lounges, Wi-Fi Internet and a cinema. On the Aruhara you'll feel that your journey across the Cook straight is part of your holiday! The Aratere meaning "quick path" is one of New Zealand's most modern, high-tech vessels. 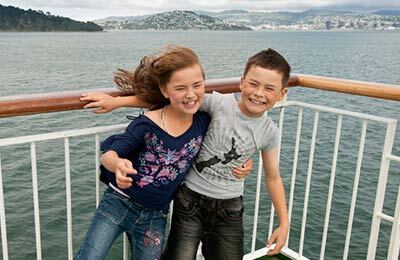 However, not only will this ship provide you with a "quick path" across the Cook Strait, but you will also enjoy a comfortable, entertaining and scenic cruise. This Interislander ship features a food court, bar, Wi-Fi internet, cinema and the Aratere Plus Lounge for the ultimate in luxury. We guarantee that any journey on the Aratere will be a memorable part of your holiday. Whatever ship you use on your Interislander ferry journey, you are certain to have a wonderful journey with this New Zealand ferry company. 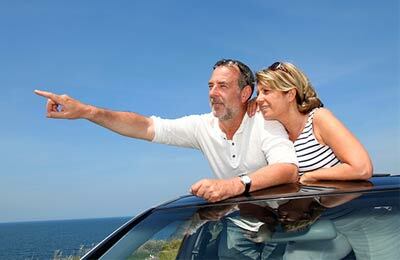 In most respects this was a very pleasant and hassle-free experience.The ticket pick-up and luggage check-in were efficiently handled and the journey itself was a delight. There was plenty of comfortable seating and many opportunities to enjoy the magnificent scenery. Our only criticism would be regarding the onboard shop,in which we experienced slow service when wishing to buy a newspaper for the journey.